Since its inception, in 2001, Google Image search did not show much love to those who created photographs. In fact, when subsequently sued for recreating and publishing thumbnails of images on its result page, it fought back and won. A victory that forever helped devalue pictures thereafter. Google considered photos as freely available assets to classify and display and by consequence, helped comfort this illusion to its users. They hugely benefited from the complete absence of a central organization (unlike the music, TV or film industries ). While it reluctantly added a minimal copyright notification, it also systematically stripped all images of their original metadata, making it almost impossible to locate its owners. Finally, it linked directly back to the image location (“View Image” link), greatly facilitating its unauthorized copy. On a recent update, it even increased the size of the thumbnail, making it even easier to copy from the result page. Numerous appeals to work with the photo industry continually fell into deaf ears. Until a few months ago: On a surprising reversal of policy and in exchange for ending a lawsuit in the EU lead by Getty Images, Google removed the controversial “view image” link. A few months later, it announced it would start displaying the copyright notice of images. At the same time, it started getting involved in industry events, like CEPIC and DMLA. So why the reversal? One look at Google figures and the answer is quite clear. In the most recent fiscal period, advertising revenue through Google Sites ( Google search, Maps, Youtube, Finance, Play) accounted for 70.9 percent of the company’s total advertising revenues ( or $95 Billion). Google.com alone gets 42.5 billion visits per months. Google Images Search represents 14 Billion of those visits a month. Yet, while Google can comfortably monetize a text search, it has yet to turn Google Image Search into a profit center. A recent study by eMarketer reveals 72% of U.S. internet users regularly or always search for visual content before making a purchase. Also, according to a research by Kissmetrics, 93% of consumers consider images to be the critical deciding factor in a purchasing decision. 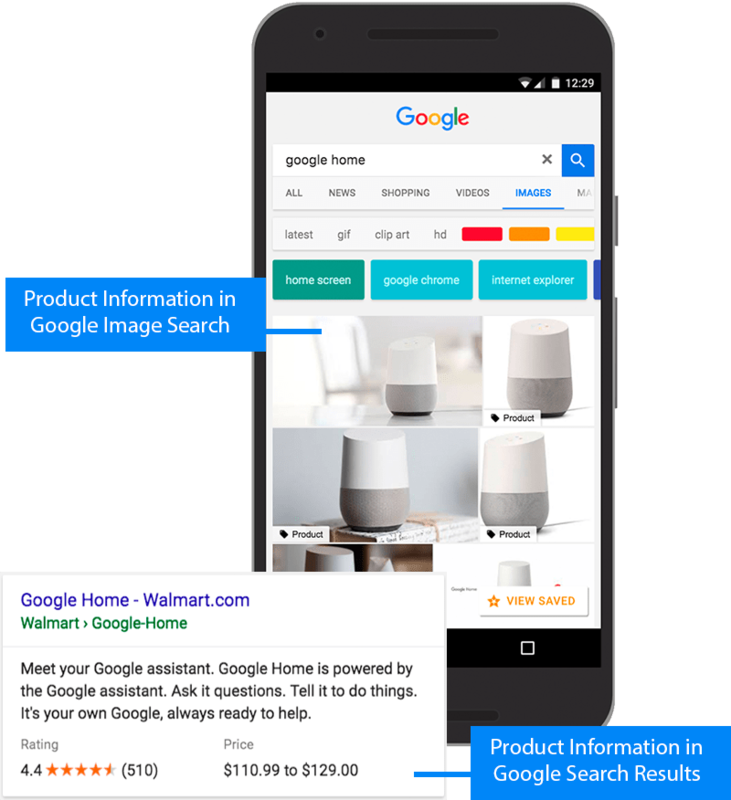 Yes, for some searches, it has turned its mobile Google image search into a product search, promoting images which link to an e-commerce site ahead of all others. It is offering retailers the possibility to pay for those placements. However, a product search is just a small part of what users look for when engaging an image search. That is precisely what Google now seeks to turn into advertising gold. It is also putting them into a straight-on a collision path with copyright laws. While legislation can be casual regarding editorial ( Safe harbor, fair use, DMCA), it is not so easy going when dealing with commercial usage. Use an image without authorization to sell a product or service, and you will learn the full force of the law. Considering the volumes, Google cannot ask permission every time it would like to use an image for advertising. Thus, it needs to automate it. What better than using a model they already have in place with Youtube. Have owners to opt-in, via a revenue share. Moreover, how best to identify owners? Their credit line. In other words, build a content ID for photography. This will help two purposes: One, allow Google to ask permission to photo owners for the right to use their images in advertising, and two, start building an authorization machine that can be used to be compliant with the article 13 of the EU’s Directive on Copyright in the Digital Single Market. Thus Google recent friendly opening towards the photography creator community is not without financial interest. In fact, it is probably solely motivated by the multi-billion dollars it could generate for the company. How would this advertising take shape? A few examples exist, like in-image advertising. Using content recognition, Google could either ad tags or banners to images with relevant content. It could insert ads within google image search like Yahoo Images already does, albeit probably in a more efficient manner. While Google decision to display image rights information is an immense improvement that should be celebrated ( and followed) by every photo creator in the world, it is not without financial afterthoughts. But if this will better protect and remunerate photographers, then there will be even more to glorify. In the meantime, what everyone should do is make sure that all their images are fully properly captioned using IPTC metadata. At the very least, it might also improve SEO.